Gal Gadot makes a thrilling debut as Wonder Woman, the superhero from the secret island of the Amazon women. 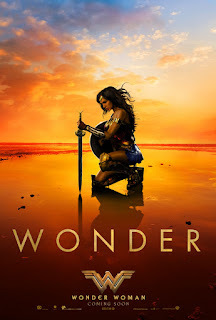 The film introduces her narrative... a young girl, growing up among the fierce women warriors not knowing she's been placed there by Zeus to some day challenge her brother Ares, the god of War. The setting is the First World War, as pilot Steve Trevor (played winningly by Chris Pine) crashes on the island, followed by a shipload of Germans. Wonder Woman's lifetime of training comes in handy, as the Amazons fight the invading army. She discovers her mission in life is to defeat war, which spurs her to join Trevor on a journey to the Western Front (by way of London.) The middle third of the film gives Gadot fish-out-of-water comedy in 20th Century London. She turns quite a few heads, marching around with her sword and shield, her long coat barely covering her iconic costume. The final section follows the usual path, a fight between good and evil, almost lost but ultimately won. The film has a nice surprise, as it reveals the story's villain, almost as good as "Luke, I am your father." "Wonder Women" tells a good tale, has a nice cast and some delicious bad characters. Most of all, it has Gal Gadot. She has so much charisma and charm and just plain beauty, that you can't take your eyes off her. "Wonder Woman," 3 stars, rated PG-13. Does it deliver what it promises? A great new super hero. Is it entertaining? A delight. Is it worth the price of admission? Something fresh in the superhero universe.